We all know the best place to start a story is at the very beginning! After a long, long time of talking, planning and training our bags were finally packed and at some ridiculous hour on the morning of Friday, 6th July we were on our way to the airport to meet up with some of the team members and to catch our 6:30am flight to Johannesburg. We have all shared photos of our journey and I’m grateful for my fellow team members for allowing me to use some for this blog. I found this amongst Donna’s photo’s, like me she was up late the night before we left (into the early hours of the morning) doing last-minute things, this picture was taken at about 12:30am and it shows the countdown on my blog ~ At 6 hours to go I was busy on my blog, typing my final blog post “I Don’t Need Easy, I Just Need Possible” to you all before I left. Seeing this picture makes me remember the excitement I felt as finally the countdown was no longer months, weeks or days, it was finally down to hours. I wish I had thought of taking a photo of it, but I’m glad Donna did! We left home around 5am and even at this ridiculous early morning hour, my parents and my best friend all made it to the airport to see me off. We met Thomas first and then before we knew it Donna and Judi had arrived too. We were lucky enough to have checked in online so all that needed doing was checking our bags in. With a sigh of relief my main bag was sitting just below 20kg’s and without a hitch it made its way to the plane. Another sigh of relief came when they didn’t weigh my hand luggage! The buzz in the air was electric and the cameras were snapping. I don’t think many people have seen such big smiles so early in the morning and people would be forgiven for thinking somebody famous was in the airport because with all the flashes going off it looked like the paparazzi were on the scene! 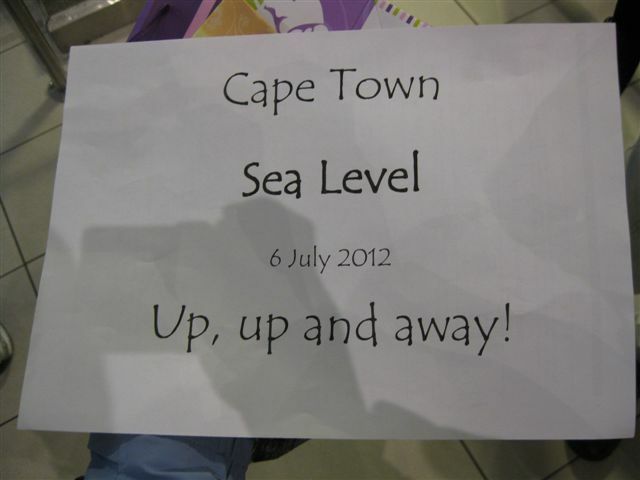 Judi, Thomas, Donna and I met at Cape Town International Airport ~ Our journey was about to begin. After countless weekend mornings awake before the rest of the world for hikes to prepare us for this trip, the time had finally arrived and Donna and I were so ready! As our friends have come to know, Donna and I are huge fans of self-timer photographs when we do our hiking trips as this allows everyone to be in the picture so we were delighted when Judi informed us that she had made signs for various parts of the trip ~ We hadn’t even left yet and I knew our group was going to get along fabulously! Our first sign for our group made by Judi. Photo by Donna McTaggart. After much excited chatter and laughter, it was time to say our goodbye’s to our loved ones and make our way through to the boarding gates. 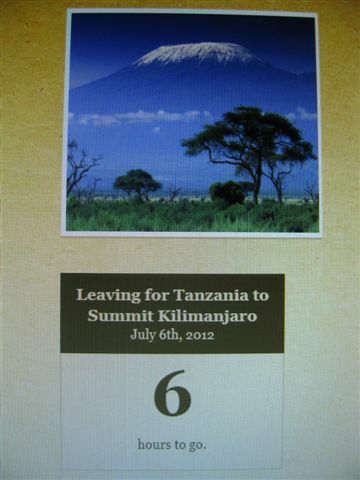 It was finally happening, we were making our way to Kilimanjaro! 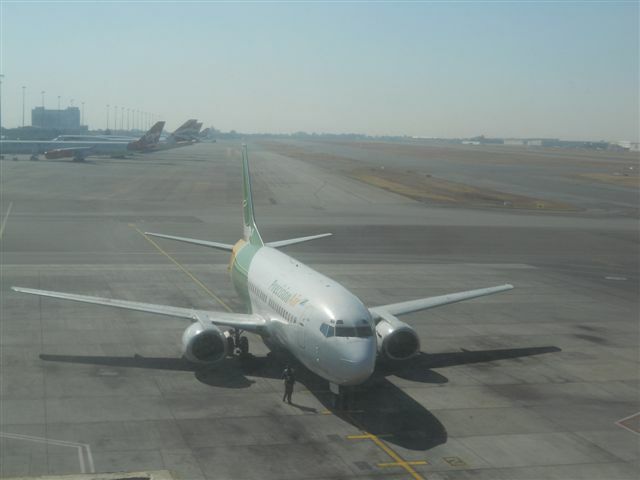 The 2-hour flight to Johannesburg was spent catching up on some sleep, considering I had only made it to bed around 3am and had to wake up again at 4am! Little did I know that these little amounts of sleep were no doubt just preparing me for life on the mountain. Arriving in Johannesburg, we had plenty of time before our next flight and decided to head off to Spur (I’m on holiday 5 minutes and I’m still involved with the company I work for!) for their yummy breakfast. We sat there for ages, catching up on last-minute messages, excited last-minute goodbye “wish I was coming too” phone calls and naturally excited chatter about our upcoming adventure. It was while at breakfast I took my first Diamox, mentally preparing myself to begin the journey of emptying my bladder every five minutes when the tablet finally kicked in. I am, however, happy to report that testing the tablet before I left seemed to do wonders for me. Compared to the first time I took it on the test run a few weeks ago, nothing happened. I didn’t have that urge to empty my bladder constantly. Maybe it really was just mind-over-matter! With a couple of hours to go before our plane was due to take off, we started making our way to International Departures to check in for our next flight. 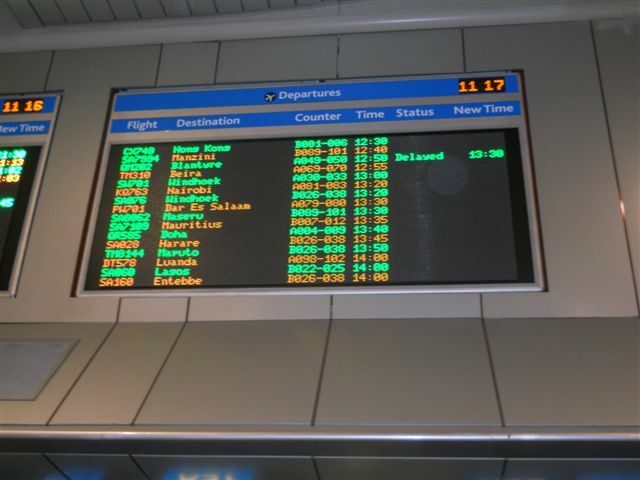 Our flight to Dar-es-Saleem scheduled to leave at 13h30 and appearing to be on time. We checked in at the kiosks at the side of the terminal, booked our seats and all we had to do was check in our luggage. This is where the fun started and this was to take longer than we anticipated! Before we even got to the counter there on floor was this big, gigantic scale. Feeling confident my baggage made it through Cape Town ok, I didn’t have any concerns. That was until my main luggage and my hand luggage both landed up on the scale. My main luggage had suddenly jumped up to over 21kg’s and the staff was not happy! Not quite sure how that happened but maybe as soon as you leave sea level everything gets heavier! I did take a gulp when I weighed my hand luggage coming in somewhere way over 12kg’s. Judi and Thomas made it through the luggage weigh-in unscathed but Donna appeared to be having the same problem as me! We were both told to go to the side and remove items from our bag as there was no ways it was getting on the plane like it was. It was too heavy they said. 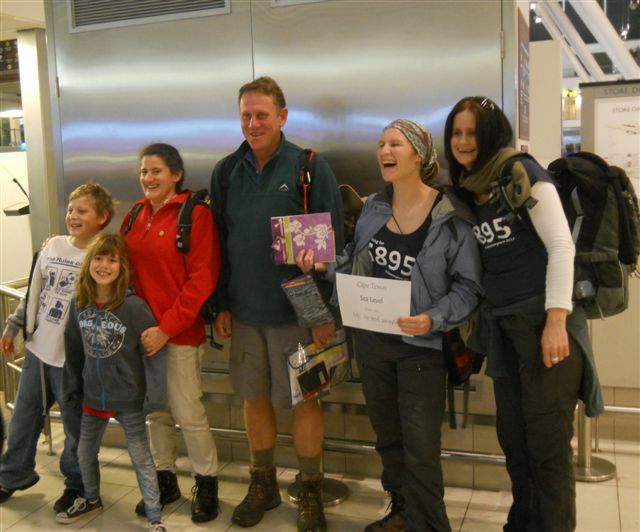 So there our group stood repacking our bags, which merely consisted of us removing our Lonely Planet Guide books and any other heavy book or item we had and neatly put them down on the ground or in a jacket pocket. Luckily the staff didn’t seem to pay too much attention to our repacking skills and when we weighed our luggage in a second time we were allowed to move on to the check-in counter, only to put all the same stuff back into our bags! Good thing Judi and Thomas’s bags were under weight as this just made up for ours. Although I do still think the scale were completely off whack! Bag finally through, it was time to check in. It was while checking in, seemingly out of nowhere, two men appeared to my right and ask me if one of us was Donna. Smiling I looked over to where Donna was standing at the counter checking in, pointed and said “That’s Donna over there.” Thinking it’s someone she knows, I watch her as she tried to compute who this man was that was asking after her…. Our group intrigued, watched as the events unfolded. 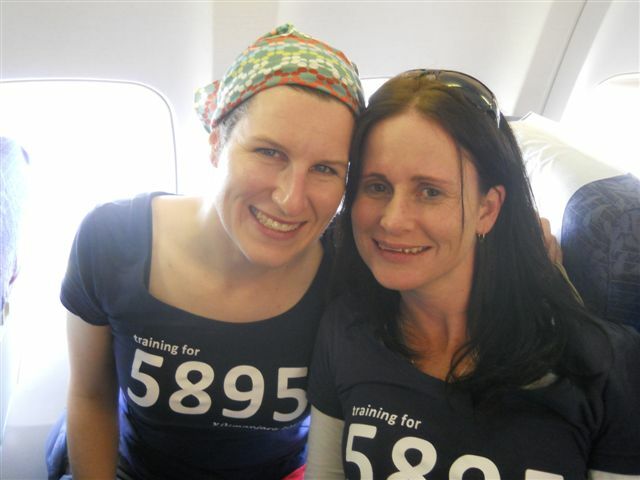 It turns out the two men, Simon and Anthony (who are brothers) and who happened to be checking into Precision Air and heading to Kilimanjaro as well, took a chance and asked for Donna. You see just a short while ago, Simon’s mother was in a chemist somewhere in Johannesburg and got chatting to another lady who was in the chemist and happened to mention that her son was off to climb Kilimanjaro, to which this lady responded something along the lines of “My cousin is also leaving for Kilimanjaro today!” So a phone call to Simon in which information was relayed about a girl heading off to Kilimanjaro today by the name of Donna. 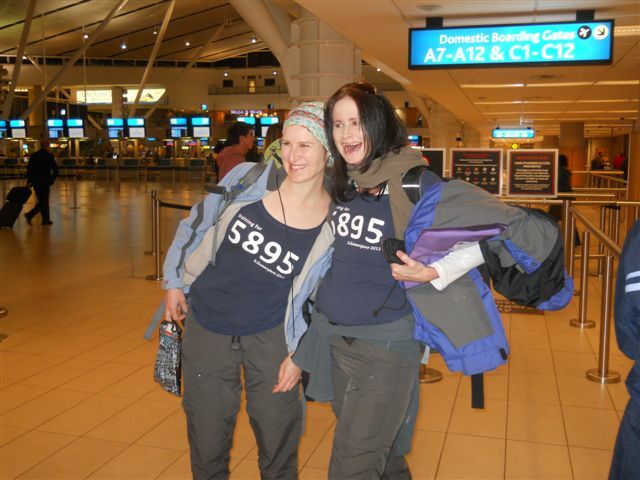 The good thing is we obviously looked the part of mountain climbers and so came about the chance meeting that unfolded at the airport check-in desk. The moment seemed to come out of nowhere by pure chance, and could even be referred to as a mere coincidence. Prior to the unforeseen occurrence, one might think such a moment was not even possible or probable to take place. This is both the wonder and awe of what we call serendipity! Maybe in the end it was fated that suddenly our luggage was overweight, thereby delaying us and putting us all on a direction collision course! In chatting with Simon and Anthony we found out that they had not booked onto any trip going up the mountain and they were just heading out that way to see what they could find on offer in Tanzania. 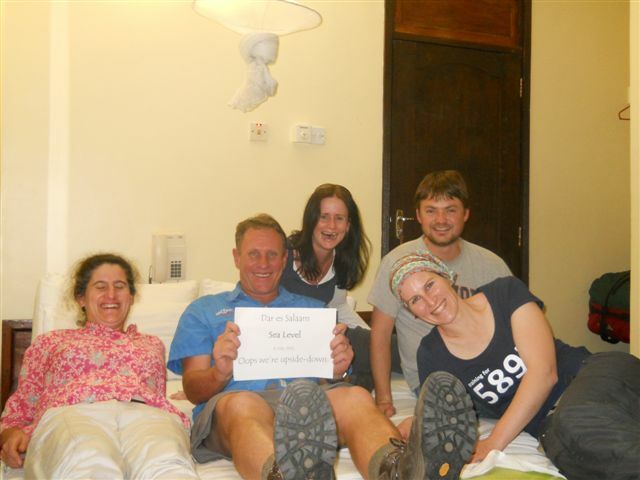 Donna and I were winging most of our holiday after Kilimanjaro, but there guys were really winging it! After checking in we waved farewell to the boys, went through customs and headed into the world of Duty Free, where naturally it was time for our next photo. 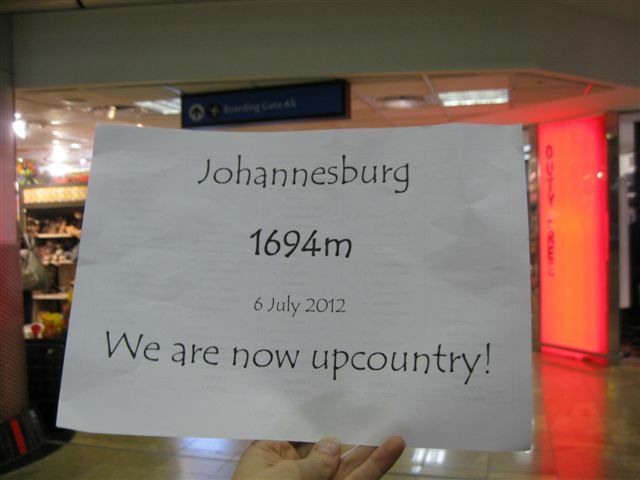 We had arrived in Johannesburg ~ We were now upcountry! 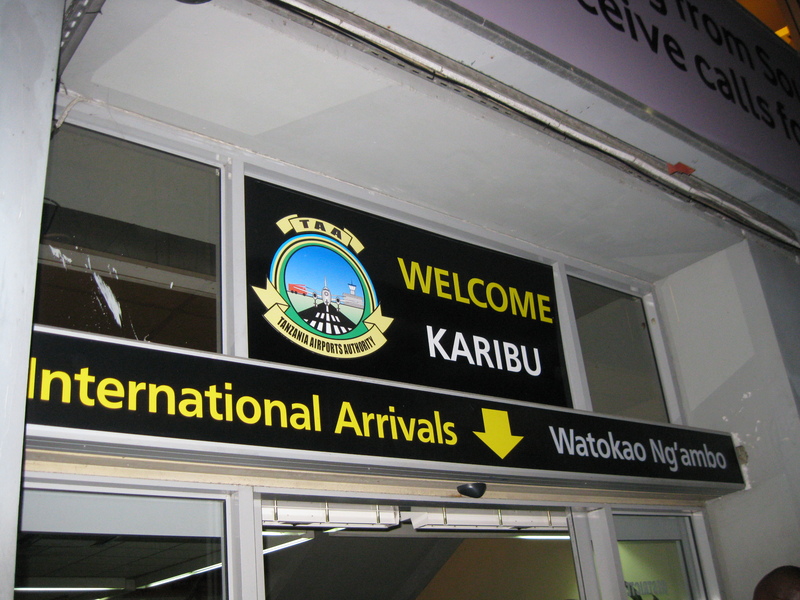 Our next sign ~ We were officially upcountry. Photo by Donna McTaggart. After some wandering around in Duty Free we headed to our check-in gate and found some comfy couches to wait for our plane, which hadn’t yet arrived from Tanzania. This was the first sign our flight was going to be delayed. This was not our plane but we were waiting for one just like it to arrive from Tanzania ~ taking pics of this one just helped us pass the time! As we waited, Simon and Anthony arrived at the gate and came to join us as we waited. They chatted to Thomas about his tour and prices up the mountain and a business card was exchanged and once in Tanzania, having checked out what was on offer, they would let Thomas know if they were going to join our trip up the mountain. They just had to let him know by Saturday (the next day) lunch time if they would join us so that extra tents, food and equipment could be arranged. Surprisingly, after not too long, our plane arrived and after a quick clean we were called to board. Upon boarding we met a lovely lady who obliged when asked how to say hello in Swahili. Little did we know upon our return to South Africa, Donna and I would be greeted by this very same lady as we stepped off the plane, and big hugs would be shared between us! Unknowingly, it was a sign of how our holiday was to go, beautiful souls crossing our paths, chance encounters and many moments that would make us smile with people who we met as we left for our journey, and only to have them meet us as we returned, as if to welcome us home again! Winging our way to Dar-es-Salaam, Tanzania. 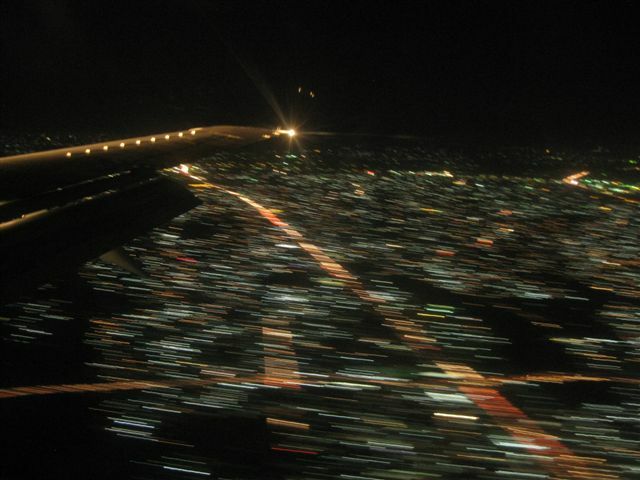 The plane ride over to Dar-es-Salaam was entertaining! We were looked after by Raphael, who again would be another that Donna and I would meet on our return trip home. Raphael was amazing and upon a request that I am sure was really just meant as a joke, Raphael obliged and went about “borrowing” champagne from first class to serve us! (Apparently First Class was rather empty) Yes we were only in economy class and you would be forgiven thinking we had been upgraded to first class, only difference was we were still drinking out of plastic cups, but who cared, we were drinking champagne and we were on our way to climb Kilimanjaro! 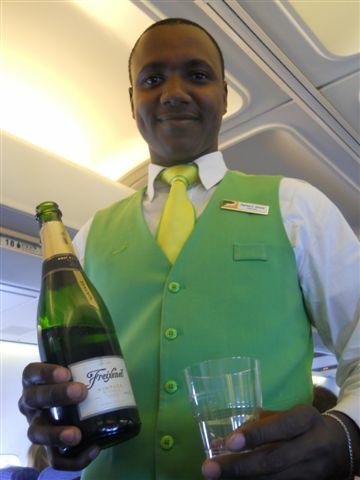 Raphael ~ Precision Air’s most amazing Cabin Crew member ~ about to serve us champagne. 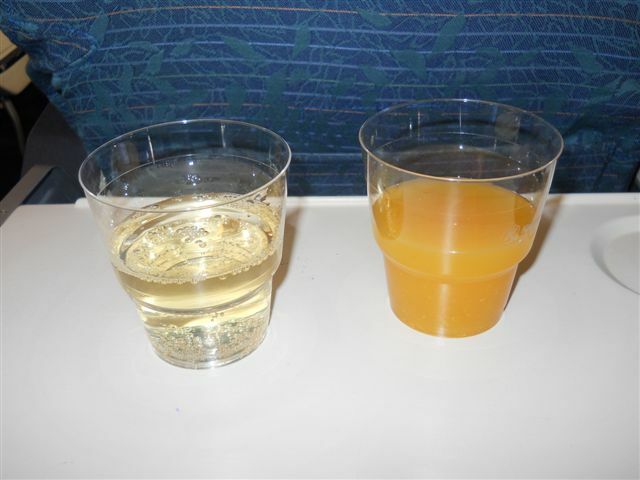 Champagne and orange juice ~ spoilt for choice! 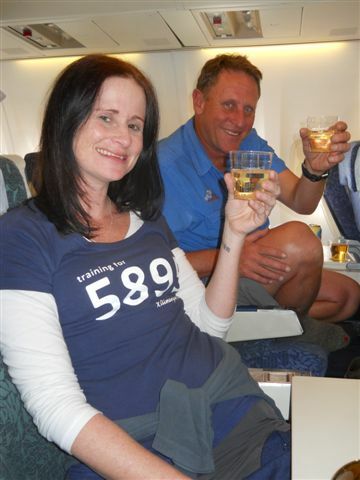 Drinking champagne and about to climb Kilimanjaro ~ it doesn’t get much better than this! I haven’t yet decided if this was a good thing or not, but as luck would have it we found Simon and Anthony sitting right in front of us. Simon was sitting in front of Judi and Thomas and Anthony was in front of Dons and me. They got an opportunity to suss our group out in our rawest form! Donna and I also got to meet some guys, who we affectionately named the Jagermeister boys. They had these funky, brightly coloured orange Jagermeister bandana’s around their necks and crazy orange sunglasses! 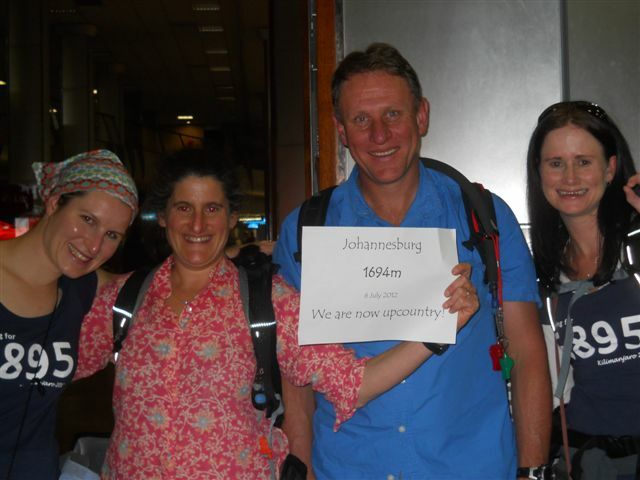 They were from Johannesburg and they were also on their way to climb Kilimanjaro. 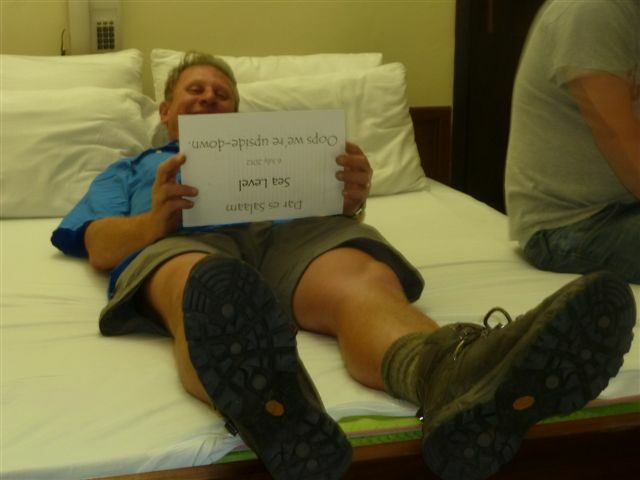 The only difference is they were drinking copious amount of beer and were starting their climb the very next day! 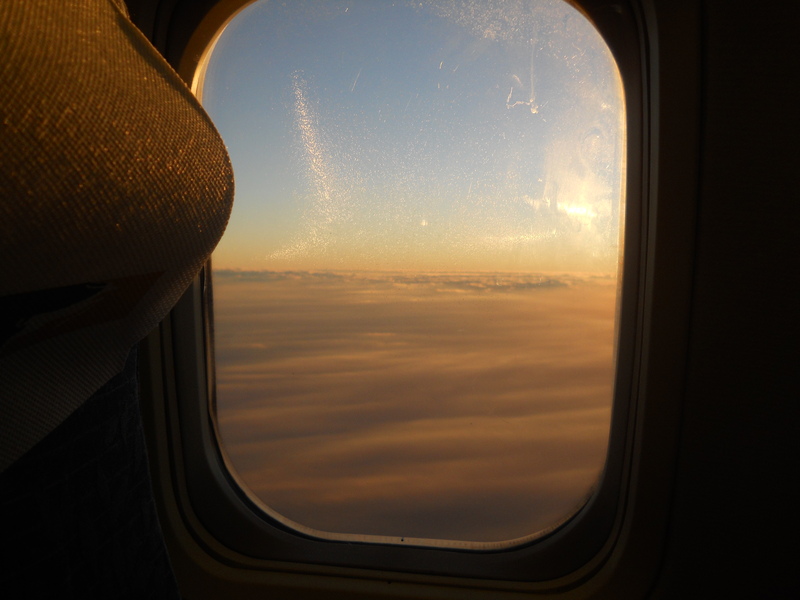 Flying above the clouds, watching the sun about to sink below. 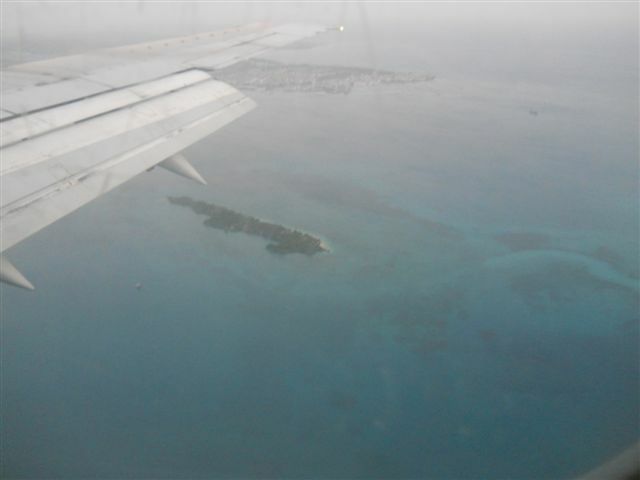 Without realising, our plane flew via Zanzibar to pick up and drop off a few passengers, allowing us to get our first glimpse of the island that we would in a few weeks be visiting. 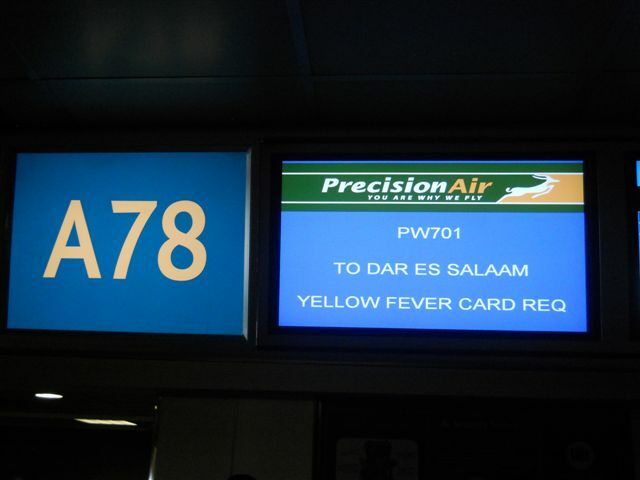 Flying to Zanzibar for a short stop en-route to Dar-es-Salaam. 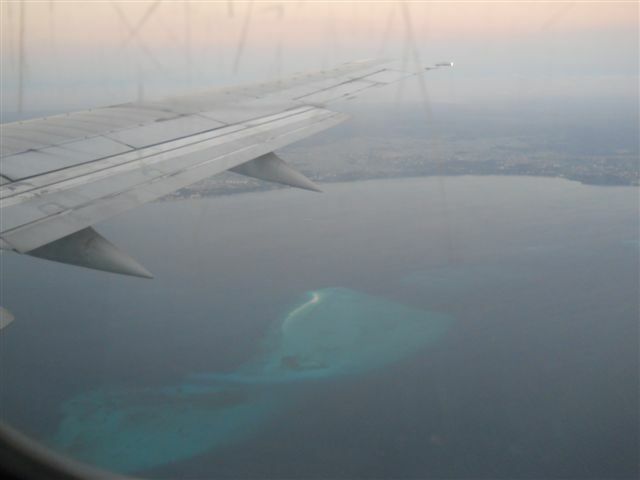 Beautiful views below as we made our way over to Zanzibar for a quick stop. 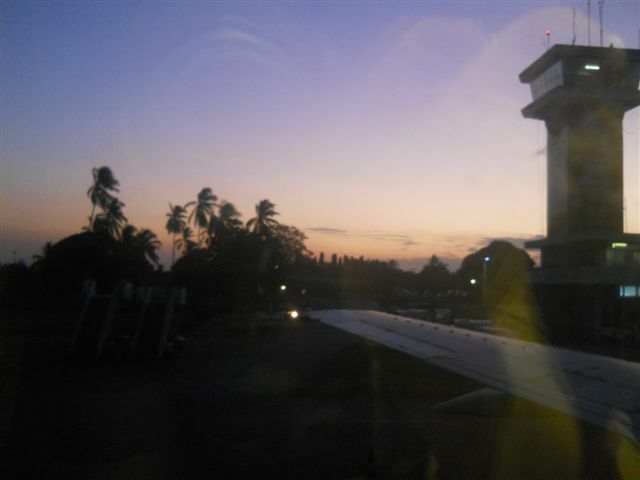 Sunset from Zanzibar airport as we wait to take off one last time. Doors sealed again, we took off and a short 20 minutes later we finally touched down in Dar-es-Salaam. 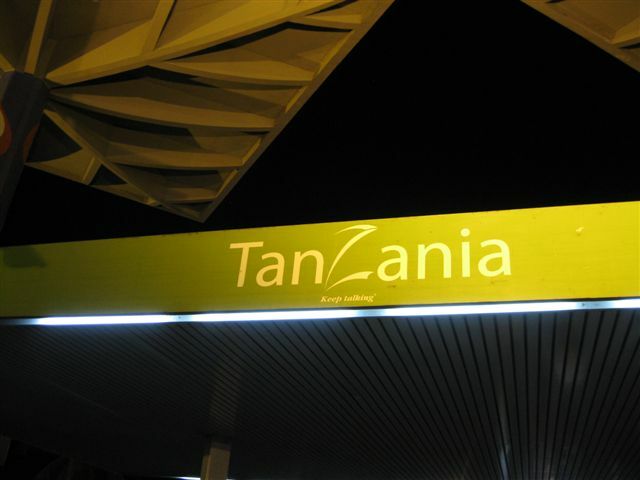 Touch down Dar-es-Salaam, Tanzania ~ We had arrived! 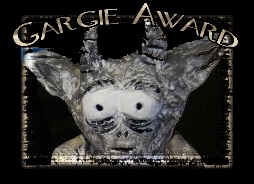 Photo by Donna McTaggart. Again we found ourselves saying goodbye to Simon and Anthony, knowing we were probably not going to see them again and wished them well on their journey up the mountain. Stepping off the plane, the air was hot and it felt so good to be back in a summer climate! The picture that gets you into trouble with airport authorities! Visa’s in hand ~ We had arrived! 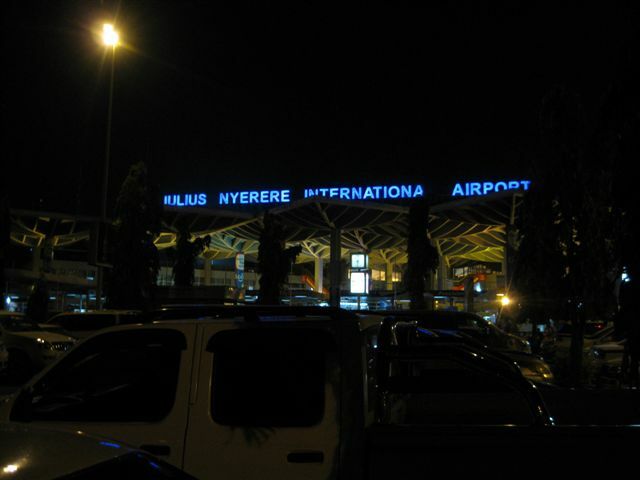 Outside the airport in Dar-es-Saleem, getting our taxi to the hotel. At the airport we met up with Sean, who was also joining our trip up the mountain. Baggage collected, fingerprints and photo’s taken, visa’s obtained and we were ready to head to the hotel, sorry motel, which was not far from the airport as we would be back at the airport again early tomorrow morning to catch our next flight. We checked into the aptly named Transit Motel, where we would go on to have an interesting night with five in a room. Don’t ask! It was before we decided to go and get dinner that it was time for our first self-timer photograph. We found a perfect stand to set up our cameras, on the tv, got everyone onto the bed, sign in hand, set up the self-timers on our camera and pushed go! Our first self-timer picture ~ Five in a room at the Transit Motel. Now to put you in the picture a bit, this is what happens. Once you push the “go” button you have 10 seconds to get into position before the photo takes so there is usually some mad running and jumping into place ~ but we do this often and have become pro’s at this. Well mostly anyway ~ sometimes we just don’t get it right. You see this time, as we pushed the “go” button on our cameras and started running, Donna knocked her camera (which was actually her sisters camera), which sent the camera crashing to the floor. One camera still up we managed to get this shot! Upon closer inspection of Donna’s (sisters) camera, it was found that the lens had been bent out of shape and would no longer close or even turn on. It was only our first night of our trip and Donna was minus a camera. The funny thing (or should I really be saying the not so funny thing) about this is that this is not the first time Donna has broken a camera in this way! Luckily, I had a spare camera with me. I know seriously, who travels with a spare camera! Spare batteries maybe but seriously, a spare camera?!! The reason why I took this older spare camera with me was for the fact that my own camera had a small issue. You see the cover for the battery doesn’t close anymore and so some first aid with the help of my dad we had managed to put a small screw and plate into my camera to hold this close. However, even though it held the batteries in place, it still didn’t close completely and I was worried at high altitudes on the mountain, where batteries lose power rapidly due to the extreme cold, I wanted to make sure I had a back-up, just in case anything happened that my camera was no longer useable. All I knew is that I didn’t want to miss out on any photo’s while I was on the mountain. I didn’t think we would have a need for this camera so soon, but five in a room and not even in the country for more than 2 hours and suddenly that spare camera was a God-send and Donna was back in business with a camera to use again! We all spent the rest of the night getting to know each other over dinner outside in the courtyard and finally upon retiring back to our room it was three ladies to the bed and the two men on the floor.